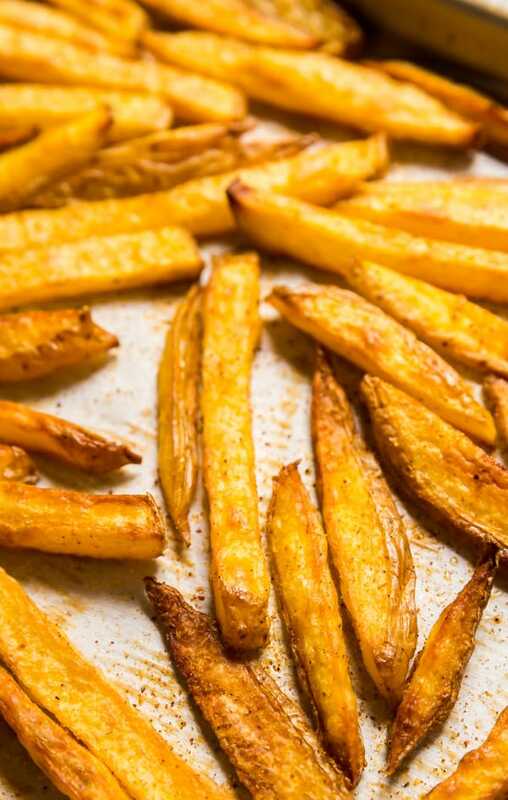 These Baked French Fries are perfectly crispy and crazy easy to make! Made with potatoes, oil and seasoning salt, these are a great weeknight side dish! I’m a sucker for a good side dish. 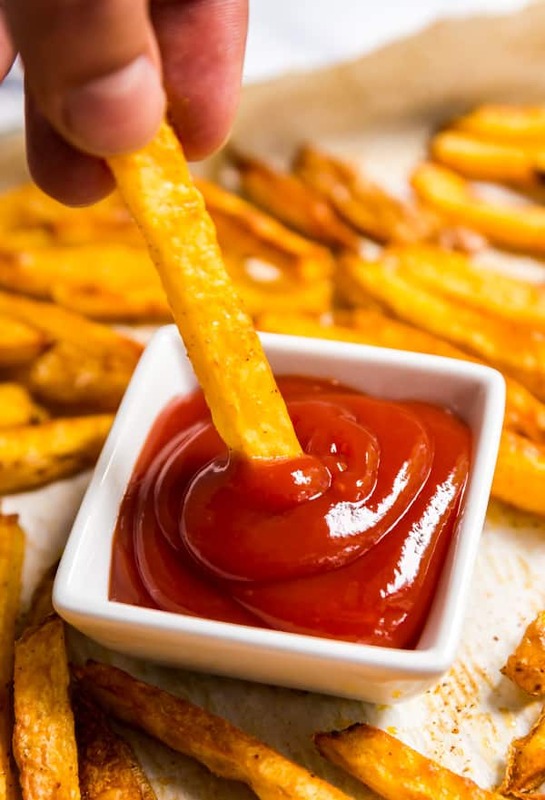 I have a variety of sides that I cycle through, but one of the most popular sides with my family is homemade french fries, or as my girls would say “Fries!!!! !” (and yes, there are exactly five exclamation points when they say it- to say they loves them is an understatement). This recipe actually came about because one night we made a last minute decision to make burgers and it wasn’t until I was unpacking the items I had just picked up from the store that I realized I had forgotten to pick up the tater tots I had planned to serve with our burgers! Sure I had rice and pasta hanging out in the pantry, but you guys, how could I possibly serve burgers without some form of crispy and delicious french fries recipe? Blasphemy! So I grabbed some potatoes that were also hanging out in a cool, dark place (kitchen tip: potatoes should always be kept in a cool, dark place but not with onions) and got to it. 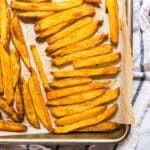 I knew that if these homemade baked french fries were going to stick out as something different than a basic roasted potato, I would have to make them nice and crispy. So I jacked the oven temp up, cut the potatoes to size and tossed them with olive oil and seasoning salt. Easy-peasy and an hour later we were enjoying our burgers with the crispiest, most delicious oven french fries I’ve ever made. Making sure your potatoes are all cut to be around the same size for even cooking. In terms of size, I cut them into sticks that were about 1/2 inch thick. You can make them thinner or thicker based on your preference, just make sure you adjust the cooking times accordingly and keep an eye on them. 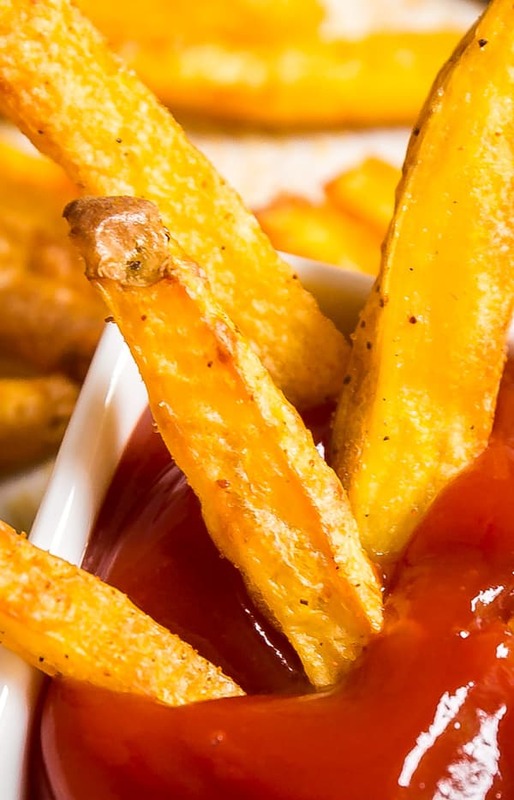 The key to nice, crispy fries is a high temperature. Don’t be alarmed my my use of a 450 degree oven. Embrace it along with each perfectly crispy bite! You can get as creative as you’d like with seasonings. I kept it simple with seasoning salt but go crazy, and please let me know in the comments what interesting seasonings you opt for! 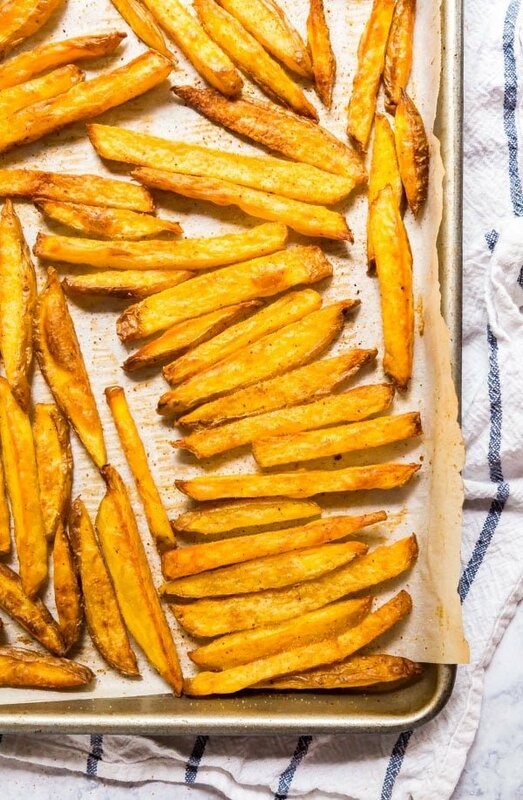 These Baked Oven Fries are perfectly crispy and crazy easy to make! Preheat oven to 450 degrees. Line pan with parchment or a Silpat and set aside. In a large bowl, lightly drizzle potatoes with olive oil and season to taste with seasoning salt (I was pretty liberal with it). Pour the potatoes into a single layer on prepared pan. Bake for 25 minutes and then flip the potatoes. Bake for 20-30 more minutes (depending on your oven- check them at 20 minutes). Serve immediately.